Time to build a website that converts! One that does more than just look good. To get started, you’ll need to begin with a template. Under the Sites tab, there's blue button that says, "Create New Website." 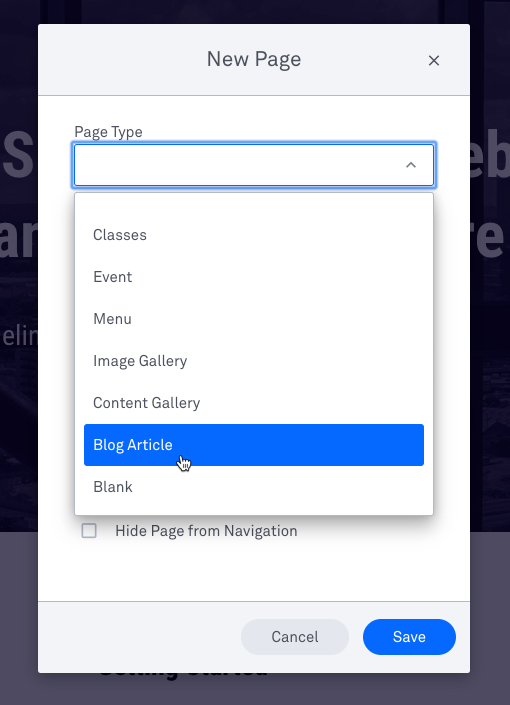 This button will launch the sites template gallery. Navigate to the Sites tab on your account dashboard and click the Create New Website button. Name your site, then click Start Building. Every template includes pre-built sections with placeholder widgets. You can edit, rearrange, delete, and add new content to customize your site. The site header is the go-to place for your visitors to see your company logo, the places they can navigate on your site, and even a quick call-to-action button if you want to encourage them to sign up for newsletters or promotions. Hover over the header and click Edit Header to change its layout and access customization and styling settings. Widgets hold all the content on your site—from headings to images to buttons. Click on any widget to access its settings and edit its content. Each widget also provides various customization and styling options. You can learn more about each widget’s options here: Using widgets. Each site template comes with a few pre-loaded pages that you can edit with your brand's look and feel. You can also add or delete site pages. 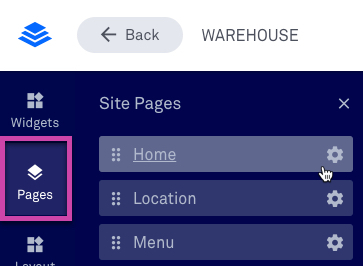 Navigate to the site pages panel by clicking the Pages tab on the left-hand side of the builder. This is also where you have the ability to rearrange pages in your site's header navigation as well as add pages that link directly to a page outside of your Leadpages site. Each site template is organized into distinct sections, columns, and rows—each of which you can customize to further edit your page. You can incentivize visitors to opt in on your site by offering a lead magnet. Learn how to set up a lead magnet here. By default, visitors who submit a form on your site will get directed to a generic thank you page. We recommend creating a custom thank you page to use with your forms. Here are details on setting up a custom thank you page. Before publishing your site, click the Preview button in the top-right corner of the builder to see it in action—you can even make sure your site looks good on mobile devices. TIP: Use device-specific display to create mobile-only sections of your page to craft a customized look for different devices. When you’re satisfied, click Publish in the top-right corner of the builder to go live! When you publish your site, each site page will get its own URL at your Leadpages Domain (hosted on our servers). 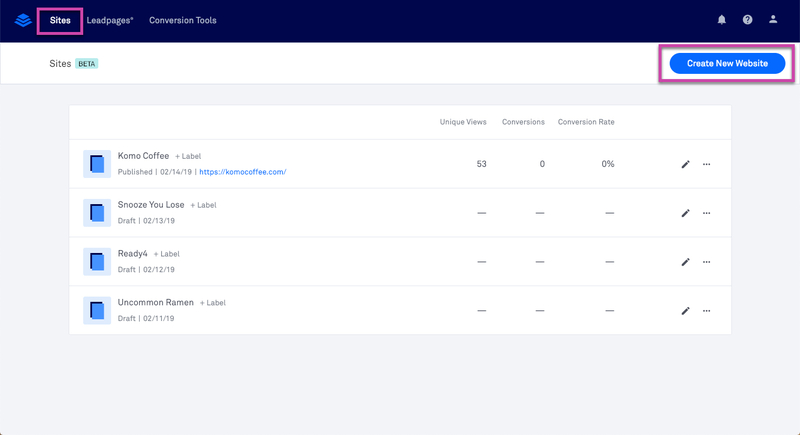 Using that URL is the quickest way to share your site—but you can also connect your own domain to Leadpages. To learn more about publishing, check out: Publish your site. We always recommend submitting a test on your forms and looking over each site page before sending it out into the world. We've got a video here demonstrating how best to test your page. How can I blog with Leadpages Sites? If you blog about once a month or less frequently, when adding a site page, use the Blog page type within the site builder and hide those pages from navigation. Add links the blog posts from a section of a homepage or primary blog page. If you blog 2-4 times a month, consider using Medium or LinkedIn to publish your content. Link to these types of blogs from the site navigation. If you blog more than once a week, set up a WordPress blog on a subdomain of a domain you have connected to your own web host. You’ll connect your site through your domain provider under the CNAME record. You can create blog.yourdomain.com for your WordPress installation.